Creative ideas are burgeoning in RDF Rollakal School! The students who are learning in an environment that encourages freedom and creative self expression are exploring various artistic mediums in order to channelize their creative spark. The urge to be creative and feel self expressed in doing so is a very natural human urge. Many schools, in their pursuit of academics and examinations, tend to have a low priority for artistic endeavours. However, in RDF schools, we realize that an enriching environment is not just one with a high quality of academic focus, it is also watching out for children’s natural curiousity, their innate talent and providing them the environment and encouragement to delve in artistic endeavours such as art, craft, singing, dancing, writing, experimenting – any manner which enthuses their spirit! Theatre Thursday has been put together by students who are interested in the medium of theatre to explore socially relevant issues. For these kids, the exploration is not just about acting; it is about using the medium of act as visual storytelling in order to highlight issues in our society that is relevant to their lives. The idea/theme, the story creating, dialogue writing, direction and acting is managed entirely by the students! It just goes to show the deep level of interest they have in their social reality and bringing it to light through a thoughtful play. Some of the themes enacted recently have been Jealousy, Greed, Anger, Failure & Disappointment. These are real emotions – reality the students and their families experience; therefore, it is very empowering for them to explore this and work out solutions using theatre. We are very proud of their imagination and effort! Another student, Pravalika, who is studying in Class 8, has always been artistically inclined. Over the past few months, she has been very interested in working with paper to explore her own creative ideas. Of course, she has been encouraged in this new found interest by the school and her teachers. She has now made several beautiful paper creations that are on display in the school. So pretty are her designs, with an amazing level of dexterity, that other children also want to learn from her! Both these cases go to show that when treated with care and encouragement, students bring out the best in themselves. RDF staff make a very conscious effort to understand student’s needs and provide them with the means required to bring their creativity to the fore. This is what builds self esteem, self confidence and a feeling of empowerment – essential life skills in today’s world. At RDF we believe in imparting a rounded education going above and beyond academics. However, our academic results are always a matter of great pride for us. This year RDF Kalleda School student Paka Upagna made the RDF family very proud by obtaining a 10/10 grade point average in the academic year 2011-12, along with this the school delivered a 100% pass result. Approximately 10 to 12 lakh students appear for this examination across Andhra Pradesh with only 1097 students achieving a 10/10 GPA. To commemorate this achievement the headmaster, teachers and some of the villagers felicitated her. Paka Upagna wants to continue studying and become a doctor and serve the rural people. Way to go Paka Upagna! The dignity of labor – and practical farming tips – are two important lessons Redlawada students learn when they work on the school farm. 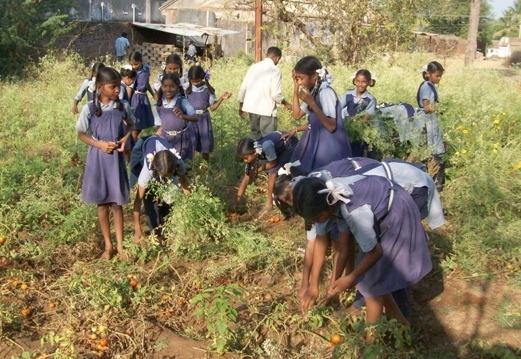 The farm-grown food is used for students’ mid-day meals and any extra food is sold at the local market since the school doesn’t have storage facilities for the perishable items.